For the past month and some change I’ve been trying to come up with a snazzy name for a shiny new blog to go along with the shiny new writing habits I’m trying to cultivate. Fail. On both counts. While I was not coming up with said blog name I was also not writing. But I can’t just have any old name, I reasoned. It’s gotta be catchy! It’s gotta roll off the tongue! It’s gotta tell the readers up front what I’m all about. It’s gotta be able to transition well into a website domain name once I have loyal followers and start making money even! I’ll definately need something interesting to put in the title banner space up top that really represents ME! *hand flourish* I mean it IS my name and reputation attached to this thing! And then the lightbulb moment when I realized that subconsciously I was using these diversions to postpone the actual writing. Not so much an avoidance to writing, per se, but to that great, great evil that mercilessly stalks Creatives in their art studios and apparently also unbeknownst to me before, their writing desks . If you write, paint, draw, compose music, you know of what I speak. It is the one ring that binds them all….. 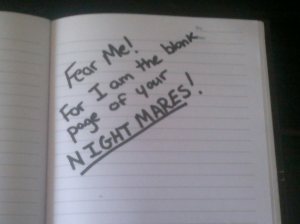 Fear of a blank page. Blank Page syndrome. Fear of a white canvas. Google any variation of those words and you’ll find pages of artists referencing the paralyzing phenomena that awaits them at the beginning of every artistic endeavor and taunts them with threats of impending failure. Far as I can tell there is no official name for it (though I did find an interesting attempt here ) but it is the same no matter what you call it. I first “caught” it when I was in college. Picture it Sicily, 1935…er, rather Richmond, 19blah-blah on the second floor of the Art Foundations building. My drawing professor was somewhat of a character. He was a thin, older white gentleman with short white hair, white beard and mustache and a reddish nose. He wore the same thing to class every single day; a long sleeve light blue denim button down shirt with pockets, white tee underneath, black denim pants and black non descript shoes. On his face, shiny glasses. In his shirt pocket a backup pair with black rims that occassionally sported duct tape at one arm joint to keep it together. This particular instructor was fond of making us draw composition upon composition (upon composition) of the same darn two shoe boxes in different arrangements with an occassional empty stool thrown in for variety, supposedly to help hone our skills with line, perspective and foreshortening which I still hate (curse those boxes!). One day in class, when we weren’t peforming particularly well by his standards in getting basic shapes down quickly onto our papers he told us to partner up with a buddy. Then he instructed us to take our buddy’s drawing paper and put it on our own easels and make some marks on it. Heads snapped around and eyeballs locked on each other throughout the studio. Partly as if to say “why is he telling us to do that?” and “Whoa,whoa…that one piece of Arches White 140lb hotpress set me back $3.00…don’t go crazy!” We made a few light hesitant marks with our charcoal sticks and #4B pencils well aware that not being successful with your own drawing is one thing but mucking up someone else’s is an entirely different beast. “Fold the paper a couple of times…put some creases in it.” We folded. We creased. “Drop it on the floor…walk over it a few times. Jump up and down on it even. Get it a little scuffy” We jumped. We Scuffed. “Now pick it up and give it back to your partner so that you have your original piece of paper back now.” With our own drawing papers back in our possessions we stood a little dumb wondering what came next. Back at the front of the studio now and poised as if he were imparting little known wisdom from one of The Master’s themselves he told us “Now that your paper has unplanned marks, its dirty from the floor and its got shoe and boot prints and scuffs and all that… you don’t have to be afraid of messing up a “perfectly good pristine” piece of paper. You can just draw”. So that is what I’m doing. Instead of being drawn in but paralyzed by the slick white emptiness of a brand new blog, I’m picking up this old scuffy, marked on, filled with bad grammer, run on sentences many starting with “And” (Sinful!) wrinkly blog and I’m going to just…..write. Yesssssss!!!! What a wonderful start…who cares about the medium when you have words to paint the canvas. I’m so excited. I am not afraid of paper – I can never even make it to the desk where the paper lies. I just avoid them both – the desk and the paper all together, circling around the creative space in a infinite loop like a lost in space meteorite.